If you take a stroll through the streets of Arrecife this weekend, don’t be surprised to find a flurry of activity amongst mountains of colored sea salt. It is the annual celebration of Corpus Christi. 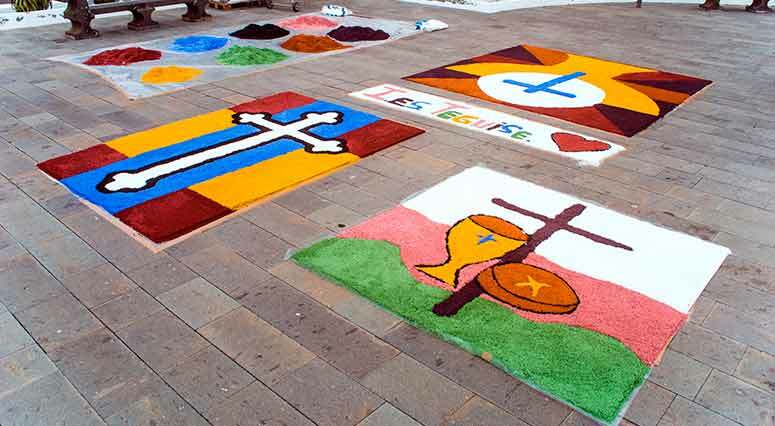 As a prelude to this religious festival, around 20 tons of sea salt are pigmented with natural dyes to create the vibrant alfombras de sal, or salt carpets, a unique tradition of the islands. 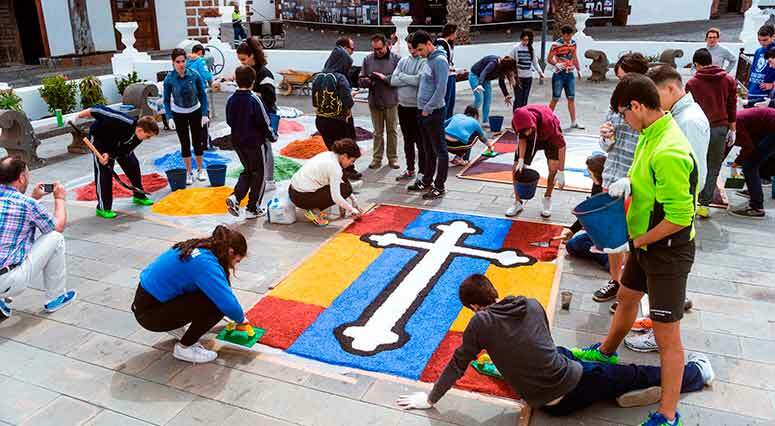 Each year, participants gather on the streets around the Iglesia San Ginés armed with wheelbarrows, shovels, wood frames, a plan and of course, truckloads of sea salt to begin work on their salt carpets. 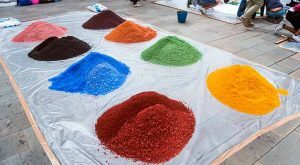 The huge sacks of sea salt are mounded up in piles to be colored with the powdered dyes that become the palette for these salt carpet artists. Small hills of salt in a range of hues, from snowy white and warm ochre to deep red and sea blue, pepper the streets of the capital waiting to be poured, spread and patted into the wooden frames that hold the salt in place as the salt carpet designs come to life. It is a spectacle to behold watching these works of art take shape as participants and observers wait for the final tapestry to appear. It might be a portrait of the Virgin Mary, a seaside panorama, or an abstract image. Trying to guess what might be made from these grains of salt is all part of the fun! 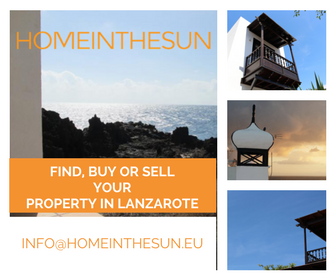 It is a fabulous way to while away the afternoon, either meandering through the streets to watch different carpets progress or to sit on the sunny terrace of a café to observe the happenings, which can go on until very late into the night. Don’t wait until to see these finished creations, you just might miss them! The procession to the church for Sunday mass has the priests and parishioners parading right over them, scattering the carefully laid carpets of salt to be washed away until next year when the fun begins again! All the municipalities in Lanzarote create these works of art so if you can’t get to Arrecife why not head to Yaiza, Haria or Teguise.